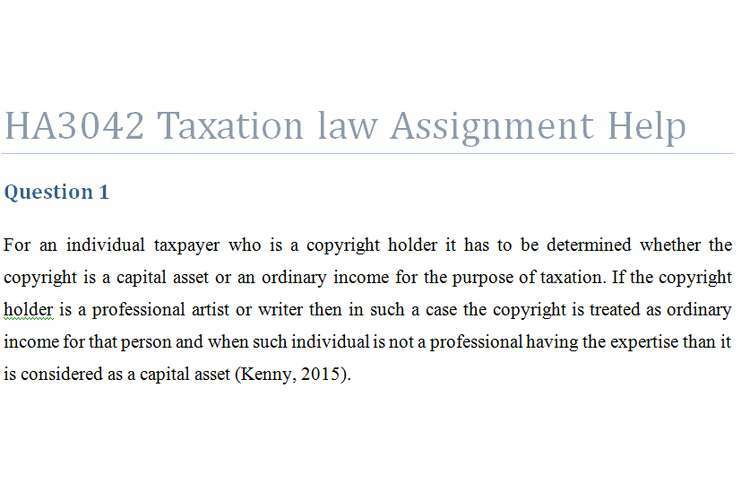 For an individual taxpayer who is a copyright holder it has to be determined whether the copyright is a capital asset or an ordinary income for the purpose of taxation. If the copyright holder is a professional artist or writer then in such a case the copyright is treated as ordinary income for that person and when such individual is not a professional having the expertise than it is considered as a capital asset (Kenny, 2015). In the given case the taxpayer is an individual who is a very famous mountain climber. Her name is Hillary. A newspaper namely ‘The Daily Terror’ which intends to publish her life story offers an amount of $10,000 to her for publishing her story in the newspaper. She herself writes the complete story without any help and acquires the right, title and interest in the copyright from the newspaper. After this her story published in the newspaper and the amount was paid to her by the newspaper. She also sold the manuscript to a library and received $5,000. Apart from this the photographs that she took while she climbed the mountain were also sold by her for $2,000. The story written by Hilary was her first story as she never wrote any story before and she is not a professional roles. Also she did not take help of ant ghost writer for writing the story. Therefore the copyright cannot be considered as her ordinary income. This will be considered as the capital gain for her. However if the capital asset which is disposed off is acquired through personal efforts by an individual, the capital gain tax is not applicable. If more than 50% income is received for the efforts, skills, labour or expertise of a person then it shall be considered as personal services income. Thus in the given case the income will be considered as personal services income. Thus the three payments will be considered as her personal exertion and not the capital asset attracting the capital gain tax. In case if Hilary wrote the story only for her own satisfaction and not for selling to The Daily News or Mitchell Library but decides to sell the story later on, this will again be considered as her personal exertion since the efforts made by her in writing the story amounts to more than 50%. Also it will be her capital asset but the disposal of this capital asset which will be made by her as per her decision to sell the story later will not be a Capital gain tax even attracting capital gain tax applicable on the transaction of sale. In order to determine the taxability of loan granted to relative or family member it has to be identified whether the transaction is carried out at arm’s length price or not. In case the transaction of loan is carried out at non-arm’s length price it shall be included in the assessable income of the taxpayer. As per section 295-550 of the ITAA 1997, loan to a related party results in the non-arm’s length income which is taxable and shall be included in the assessable income of the taxpayer. Based on the private rulings the factors that are used to determine whether the transaction of loan derives arm’s length income or not by ATO include whether the loan is granted at low or nil interest rate but this alone cannot be used for the determination other factors shall also be considered such as whether the income which arises from the asset purchased out of loan is generating non-arm length income or not, whether the purchase of property from the vendor is made at arm’s length price or not, whether amount of loan can be justified as the value of investment i.e. LVR ratio, whether the income which is arising from the investment is increased due to the non-arm’s length nature of the agreement of loan between the related parties. Thus it can be concluded that the loan granted to a related party or relative shall be included in the assessable income if the transaction is carried out at non arm’s length price otherwise will not be taxable (Ferraro, 2014). In the given case taxpayer is a parent who granted short term housing loan to her son of $40,000 with an agreement that the amount of $50,000 will be paid after five years. In this case the loan is granted to related party with an agreement and the amount is recoverable with interest. Since the low interest cannot be considered alone as determining factor for arm’s length price of transaction, therefore the fact that the loan is granted with formal agreement along with the condition of recovery of amount with interest after five years makes it as the transaction at arm’s length price and thus the amount of loan lent of $40,000 will not be included in the assessable income of the parent. However she will have to pay tax on the interest component of the loan amount. The amount of $10,000 will be included in the assessable income of parent taxpayer as income from interest under the head other income. If the case is reconsidered in the light of facts that no formal agreement is entered into between the mother and the son and no security is provided by the son for the amount lent to him the effect of this on the assessable income of parent will change. The taxpayer also asked her son to not to pay interest on the amount lent to him. The son repaid the amount of loan to his mother after two years with an interest of 5% p.a. on the amount borrowed by him. Another fact which relates to this case is that the son presented only one cheque for the payment of amount of loan along with interest to his mother. From these facts it can be concluded that the granting of loan is with interest and the amount of loan and interest was recovered in lump sum through a single cheque. Although there was no formal agreement between the related parties but on the basis of fact that the loan was repaid with interest it shall be considered that the transaction of loan was carried out at arm’s length price and thus it is not taxable. Hence the amount of loan will not be included in the assessable income of parent taxpayer however; she will have to pay tax on the amount of interest included in this repayment which will be included in the assessable income of mothers under other income which is taxable (Cui, 2014). In the given case the taxpayer is an individual who works as an accountant. He purchased a vacant block of land in Brisbane as on 1st October 1980. After this he constructed a house on the vacant land on 1st September, 1986. On this date the market value of land was $60,000 and the cost of construction to Scott was $90,000. After the completion of construction, the property was rented out. During the current tax year the property was sold by Scott for $800,000 on 1st March, thereby attracting capital gain tax. a) Based on the information above, determine Scott’s net capital gain or net capital loss for the year ended 30 June of the current tax year. When a real estate property or sold or disposed off, it is considered to be a Capital Gain Tax (CGT) event, thus attracting the capital gain tax applicable on the seller of the property being a taxpayer. The difference between the capital proceeds received from the sale of the property and the cost of ownership or acquisition of property by the owner which is known as the cost base is the capital gain or capital loss on the property. Thus the net capital gain of Scott for the year ending 30 June, 2016 is $325,000. Note 1: The individual taxpayers are allowed a discount of 50% on the capital gain if the asset is held by the individual for more than one year before its disposal. This has been made applicable after 20th September 1999 prior to which indexation of cost base was allowed to taxpayers as benefit from disposal of long term capital assets. Note 2: An asset which is acquired by the taxpayer before 20th September 1985 is known as a pre-CGT asset which means that capital gain tax is not levied on disposal of such asset. But if any kind of substantial change is made in the asset such as any type of addition into the asset or in case the owner of the asset who acquired the asset dies, then the asset no longer remains as the pre CGT asset and as a result capital gain tax becomes applicable on such asset in event of disposal. Although the taxpayer purchased the property on 1st October, 1980 therefore it qualifies to be a pre-CGT event but due to the construction made by the taxpayer after 20th September 1985 which is an addition to the asset the status of pre-CGT asset is lost for the property and thus capital gain tax becomes applicable (Minas, 2013). b) How would your answer to (a) differ if Scott sold the property to his daughter for $200,000? If the real estate property is given as gift or disposed off without receiving anything then in such case it is considered as the capital proceeds equalise to the market value of property as on the date of disposal. If the property is transferred or sold among the family members to each other, then in such case if the sales are not made at the arm’s length price of the transaction then also the capital proceeds for such sale are considered to be the market value of property on the date of disposal. Here arm’s length price means the price at which the buyer and seller of the same property act independently of each other and the price is not influenced in a way that a proper bargaining has been done between them. In the given case the property is sold by Scott to his daughter at the price of $200,000 while the price at which the property is independently sold is $800,000. Since the sale of property is not made to his family member by him at the arm’s length price therefore the market value of property which is $800,000 shall be considered as the capital proceeds for this transaction of sale of property between Scott and his daughter. The net capital gain in this case will be same as (a) above which is $325,000. Thus the answer in this case will not differ from above. c) How would your answer to (a) differ if the owner of the property was a company instead of an individual? If the owner of the property would be a company rather than being an individual the answer would be different. In that case the discount of 50% on the amount of capital gain calculated initially would not be allowable since it is allowed only to the individual taxpayers and not the companies (Burkhauser, 2015). Thus the net capital gain for the company in this case would come out to be $650,000 and the capital gain tax shall be payable by the company business plan on this amount of capital gain and not the net capital gain of $335,000 as payable by Scott. Due to non-availability of benefit of 50% discount to company the amount of net capital gain would increase by 50%. Burkhauser, R.V., Hahn, M.H. & Wilkins, R. 2015, "Measuring top incomes using tax record data: a cautionary tale from Australia", The Journal of Economic Inequality,vol. 13, no. 2, pp. 181-205. Cui, W. 2014, "Taxing indirect transfers: improving an instrument for stemming tax and legal base erosion",Virginia Tax Review, vol. 33, no. 4, pp. 653. Ferraro, R. 2014, "Tax education: Applying tax law in practical situations", Taxation in Australia, vol. 48, no. 8, pp. 412. Kenny, P., Blissenden, M., Villios, S., MacKenzie, G. & Xynas, L. 2015, Australian tax 2015, LexisNexis Butterworths, Chatswood;Chatswood, NSW;. Krever, R. 2011, "Analysing implicit tax expenditures",Melbourne University Law Review, vol. 35, no. 2, pp. 426-448. Minas, J. & Lim, Y. 2013, "Taxing capital gains - views from Australia, Canada and the United States", eJournal of Tax Research, vol. 11, no. 2, pp. 191. VILLIOS, S. 2011, "Measuring the tax gap of business taxpayers in Australia", Revenue Law Journal, , no. 21, pp. 8-27. Xynas, L. 2010, "Tax planning, avoidance and evasion in Australia 1970-2010: the regulatory responses and taxpayer compliance", Revenue Law Journal, vol. 20, no. 2010, pp. 38-75.